1 Pc PUNK BERINA NO. 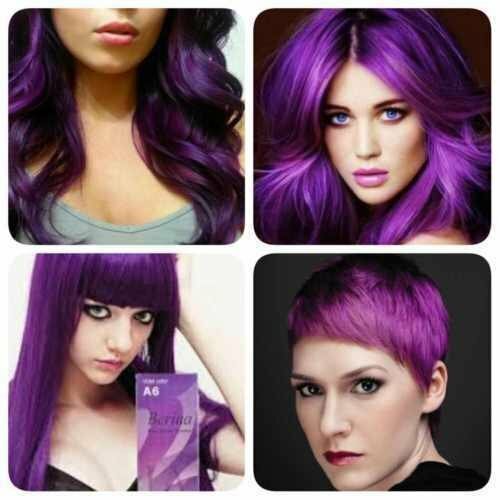 A6 HAIR CREAM SEMI-PERMANENT HAIR DYE COLOR PURPLE Product Description Berina Hair Color cream containing an innovative component which protects and provides glamours colour to hair as desired. Berina Hair Colour Cream contains active and powerful radiants which confers the product in a permanent color and silky hair, In order to make your hair more smooth and silky, use Berina Protein Conditioner after colouring with Berina Hair Color Cream. To make your hair dramatically healthy, use daily Berina Protein Conditioner. Package Contents: - Colour Cream 60 g - Cream Deleoper 9% w/w Before Colouring : Please read the instructions before using so that you acheive the best colour resut. Wear plastic gloves and a cape to avoid any stains Long and thick hair may require 2-3 packs to apply for the first time Wait for three weeks after perming, highlighting or bleaching before coulouring. before colouring hsir should be clean and dry. Lighter hair colour always takes colour better whilst dark hair needs bleachig first.Take an allergy test 24 hours before using. Avoid using conditioner or oil before colouring.